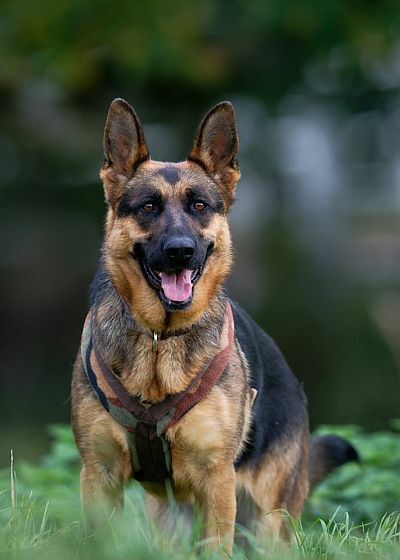 Emily, a beautiful German Shepherd girl only four years old, really needed our help. Originally rescued in Bosnia where it was suspected that poor Emily was suffering from severe hip dysplasia and although she was well cared for in the shelter they were unable to give the veterinary treatment needed as there are no orthopaedic vets with the right knowledge, equipment or medication available. As soon as she arrived at PACT Emily was referred to our orthopaedic consultant and further x rays taken and we discovered that her hip dysplasia is mild and does not need surgery. Her problems appear to be caused by a congenital deformity. Although we are still awaiting further medical opinion, at this stage we are advised to monitor her closely as surgery at the moment could lead to a deterioration of her condition rather than improvement. Emily is friendly, happy dog, good with other dogs but not so good with cats and as she does not seem to be in any pain, she is very alert and active. We are looking for a very special person who can give this lovely girl lots of love and attention but will understand that long distance walks and play with young children are not advisable. Can you help us help Emily, either by donating towards her veterinary fees or by offering her a forever home? PACT will of course continue to pay any veterinary costs incurred for Emily as it is not possible to insure her. If you think you could offer Emily a home please contact the sanctuary in the first instance on 01362 820775 or email us.